Dan and Lucy’s wedding was lovely; Sophie – Dan’s sister – was trying hard not to show her loss, but with her boyfriend dumping her the night before the wedding, it was hard. She’d had just a little too much to drink when Dan’s best friend Nick took over keeping her in line. But Sophie never expected a one night stand with Nick..
Beth and Hannah were twins with Hannah the older of the two – by ten minutes – and she was naturally the one in charge. Hannah was a vet and loved animals – probably more than humans if the truth be told. Beth was a single mother after losing her partner Joe while she was pregnant with Siena. Beth was a paramedic, constantly busy and trying to juggle motherhood and work, but ten-year-old Siena made it all worthwhile. When Irishman Declan brought an orphaned joey into Hannah’s veterinary practice for care, sparks flew. But Hannah was determined not to be swayed by his good looks and incredible charm. Nothing would come of it anyway.. The Faraday sisters all had secrets. Would they keep them and remain alone? Or would circumstances change as the days and weeks went by? 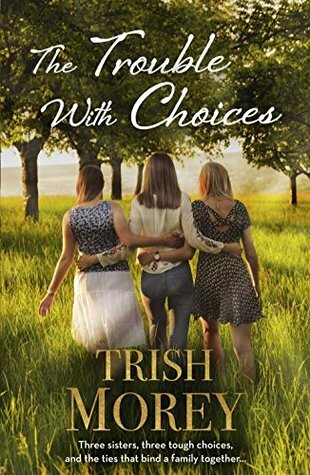 The Trouble with Choices by Aussie author Trish Moray is a romance set in the Adelaide Hills in South Australia, in among the vineyards and beauty of the hills. The setting is gorgeous, the characters grew on me. Initially some of the choices made had me rolling my eyes, but as the story moved along things settled down. Six-year-old Min was a favourite, and Nan was adorable, with Pop being a bit of an old scoundrel. An enjoyable novel, The Trouble with Choices is easy to recommend to fans of the genre. Sign into Goodreads to see if any of your friends have read The Trouble With Choices.